STEMBoard delivers support to federal clients to solve complex problems, enable integration of technology and mission at key points and provide actionable intelligence. At STEMBoard, our expertise enables our clients and partners to move quickly to complete the mission at hand. 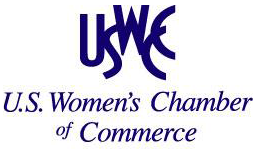 ‍STEMBoard, an 8(a) certified economically disadvantaged woman-owned small business (EDWOSB), creates smart systems and solutions for federal and large-scale private sector clients. We go above and beyond to proactively identify gaps and customer needs, allowing us to propose solutions that lead to organic growth opportunities for every client. As a result, we provide clients high-quality, cost-efficient solutions in engineering and development, IT services, program and project management, data management, ingestion, and analytics. 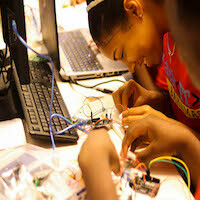 STEMBoard creates technologies that help advance our nation and its citizens. We believe in Integrity, Innovation and Inclusion. We seek to improve society through systematic innovation and by attracting, nurturing and developing the world’s emerging brilliance. Our team brings together bright minds from a variety of backgrounds. We deliver high-quality solutions, on time and on budget. We develop workflows that solve discrete problems while growing enterprise data science capabilities. The STEMBoard team is focused on enhancing strategic capabilities that solve real-world problems. We work closely with clients to identify and define their mission needs and processes. By efficiently inserting data science tools where necessary, our analysts quickly deliver initial results while iteratively collecting feedback to mature the end-product. 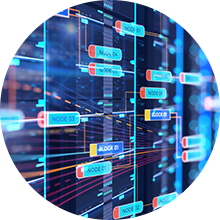 We directly address fragmented and frequently undiscoverable information within the Department of Defense and adjust information flows to individual applications. Data sharing within and between organizations remains a core challenge in the Federal sector. Information is often fragmented, stove-piped and frequently undiscoverable; and today’s data management policies and technical limitations can hinder sharing and tether data workflows to individual applications. 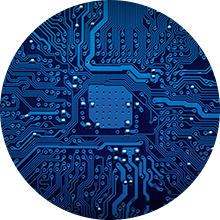 The functional experts at STEMBoard support the full spectrum of activities to identify, obtain and condition datasets to ensure data availability. Our team leverages their experience with structured and unstructured data handling activities to clean, tag and ingest mission-relevant information into environments such as GovCloud and Amazon Commercial Cloud Services (C2S). We optimize technology resources to improve critical business processes while leveraging industry best practices. 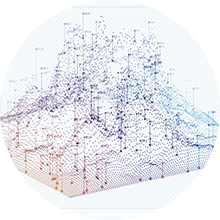 Developing relevant and scalable analytics is necessary to leverage data to provide actionable insights. At STEMBoard, we drive value to missions by supporting the development, deployment, and operations of a variety of multi-INT, advanced data analytics leveraging Department of Defense Intelligence Information System (DoDIIS) and Intelligence Community Information Technology Enterprise (IC ITE) development environments. Our methods grant greater insight into existing data warehouses by correlating disparate sources and applying statistical and mathematical analysis techniques, including machine learning where appropriate. We create mission relevant, scalable analytics that align strategically with the needs of Federal agency CIO’s. STEMBoard empowers organizations to succeed by focusing on minimizing risks and accomplishing high priority tasks quickly. As a partner across multiple efforts in the federal and defense market sectors , we understand the urgency of mission need, the importance of compliance and necessity of strategic alignment with organizational strategy. STEMBoard has honed the ability to navigate the complexity of competing and complimentary initiatives while making data informed decisions to enable mission valued solutions. Joint and Coalition Special Operations Forces (SOF) operate in environments that place them at high risk of abduction. Developed a system that protects sensitive borders by securely monitoring radio-frequency signals to detect illicit activity. The airborne in tunnel surveillance system unmanned aerial vehicle enables safe reconnaissance of discovered illicit tunnels. EPS contract provides a combination of enterprise tools that standardize the Agency’s database architecture. DIE Data Strategy plan impacts all data where DIA is originator, collector, consumer, or partner including intelligence collection. T09 provides maximum mission flexibility across the DIE and Intelligence Community (IC) through scalable mission and data agnostic services. The Intelligence Community’s (IC’s) EMT service enables the IC ITE to leverage cloud based service integration. EIEOS provides worldwide engineering services to operate & maintain Department of Defence Intelligence Information System. 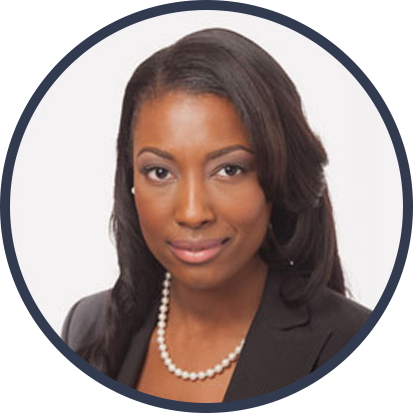 Aisha Bowe is the Founder and CEO of STEMBoard, an agile technology solutions company that specializes in using big data to create smart systems & software solutions for clients in the public and private sectors. As CEO, Bowe leverages more than 10 years of experience to lead the growth and retention of STEMBoard’ s portfolio of multi-million-dollar contracts for agencies within the Department of Defense (DoD). Under her leadership, Bowe’s team of engineers, data analysts, and IT experts ensure agencies achieve their mission. Bowe holds Master of Engineering degree in Space Systems Engineering from the University of Michigan. Government Defense Contracting since her move in 2010 to Northern VA/WMA Region. 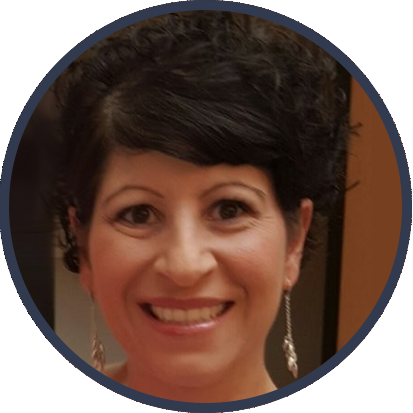 As the Director HR and Talent Management Donna leads and supports human capital management efforts at STEMBoard and responsible to grow the organization with its most valued asset; it’s People and Operations. Communications from Northeastern Illinois University and holds a double Masters in both Business Administration and Human Resource Management from The Keller Graduate School of Management in Chicago, IL. She has a passion for employee engagement and serving communities we work and live in. Donna enjoys volunteer efforts supporting Military to Civilian (M2C) transitioning members with resume writing, interviewing, mentoring and job search networking skills. She is an active LinkedIn Open Networker (LION) and welcomes all invitations to connect. 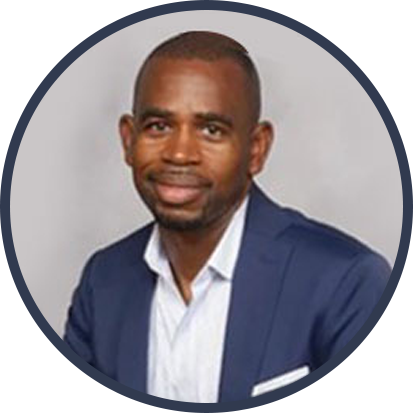 Dr. Jarvis Sulcer is a strong advocate for education as well as a versatile and dynamic leader, educator, entrepreneur and engineer with a track record of success in for-profit and non-profit organizations. At STEMBoard, Dr. Sulcer oversees strategy, business development and student engagement for the STEMBoard Education division. 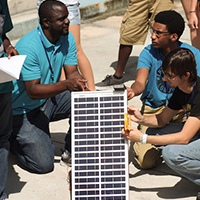 Key accomplishments include management of the largest STEM camp in the Bahamas for high school students, the establishment of a strategic partnership with INROADS to develop and implement STEM content and programming, and the scaling up of STEM camps across the U.S. He received his bachelor’s degree in Physics from Southern University and a Master of Science degree and Ph.D. in Nuclear Science and Engineering from Cornell University. STEMBoard is a technology solutions company that creates smart systems and software solutions for government and large-scale private sector clients. We are growing fast and need passionate, innovative people who love working with technology and are ready to make an impact. You will work with great people who love what they do: our team includes published authors, patent holders, and internationally renowned engineers. We care about our employees: we invest in professional development and reward creativity. Starting day one, every employee is bonus eligible and receives 20 days of paid vacation. 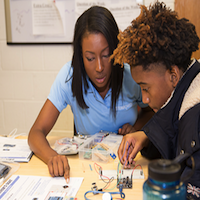 We invest in the community: STEMBoard boasts a lively education and outreach program that teaches engineering to the historically underserved. In this role you design, implement, and deploy enterprise Web-based development projects that support will support high visibility DoD clients. 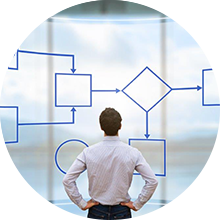 Leading and managing multiple technical tasks in software design, implementation, and integration projects. The ability to independently perform exceptionally complex software development tasks. Ensuring efficient delivery of contract capabilities using industry standards and repeatable processes. Mitigation of risks, control costs/ schedule variances, and effectively manage large scale, integrated software projects. Bachelor’s and 8+ years of experience; or Masters and 6+ years of experience; or a PhD and 4+ years of experience. Experience with SQL development, Docker, Kubernetes, or RedHat OpenShift. Experience with DevOps automation tools, including Chef, Puppet, or Ansible. Knowledge of Java, XML, and JSON. Knowledge of REST best practices. STATEMENT OF NON-DISCIMINATION: In keeping with our beliefs and goals, no employee or applicant will face discrimination/harassment based on: race, color, ancestry, national origin, religion, age, gender, marital/domestic partner status, sexual orientation, gender identity, disability status, or veteran status. STEMBoard strives to prevent other subtler forms of inappropriate behavior (i.e., stereotyping) from ever gaining a foothold in our company culture. Whether blatant or hidden, barriers to success have no place at STEMBoard. We care about our employees: we invest in professional development and reward creativity. Starting day one, every employee is bonus eligible and receives 14 days of paid vacation. The Data Integration (ETL) Developer is responsible for developing applications and processes that are required to extract, transform, cleanse, and manage data and metadata to be loaded into a data warehouse, data mart, or operational data store. Perform development of data extraction, ingestion, transformation, enhancing, formatting, validation, cleansing, processing and analytics components. Develops extraction, transformation, and load (ETL) processes to integrate data across multiple sources for analysis purposes. Defines and captures metadata and rules associated with ETL processes. Creates and executes unit tests and documents results. Supports functional, integration or system testing, and UAT. Plan and conduct major technical phases of significant projects by coordinating the efforts of technical support staff and the performance of assigned projects. B.S. degree or equivalent work experience in computer programming, analysis, and design is required. Education should include both formal and work related experiences. •	2+ years’ experience working SQL databases such as Oracle, SQL Server, PostgreSQL, SQLServer2+ years of experience setting up and developing ETL applications and processes. •	2+ years’ experience developing on UNIX/Linux platforms. •	2+ years’ experience developing with interpreted languages (e.g. shell scripts, PL/SQL, Perl, or similar). •	2+ years’ experience working in a data warehouse or data mart environment. In keeping with our beliefs and goals, no employee or applicant will face discrimination/harassment based on: race, color, ancestry, national origin, religion, age, gender, marital/domestic partner status, sexual orientation, gender identity, disability status, or veteran status. STEMBoard strives to prevent other subtler forms of inappropriate behavior (i.e., stereotyping) from ever gaining a foothold in our company culture. Whether blatant or hidden, barriers to success have no place at STEMBoard. The Data Scientist develops innovative and effective approaches to solve intelligence problems and effectively communicates results and methodologies. •	Conduct advanced data analysis, design experiments and build analytic models to validate findings or test hypotheses. •	Utilize patterns and variations in the volume, speed, type of data (e.g., images, text, etc.) and other characteristics of data in predictive analysis. •	Identify/create the appropriate algorithm to discover patterns. •	Apply highly complex algorithms that incorporate Al techniques in machine leaning, computer vision, planning and NLP. •	Leverage advanced statistical and predictive modeling techniques to improve mission analytics. •	Collaborate with subject matter experts to select the relevant sources of information and techniques to answer mission problems. •	Bachelor’s and 8+ years of experience; or Masters and 6+ years of experience; or a PhD and 4+ years of experience. •	4+ years’ experience working SQL databases such as Oracle, SQL Server, PostgreSQL, SQLServer. •	4+ years’ experience developing on UNIX/Linux platforms. •	4+ years’ experience developing with interpreted languages (e.g. shell scripts, PL/SQL, Perl, or similar). •	4+ years’ experience working in a data warehouse or data mart environment. •	You will work with great people who love what they do: our team includes published authors, patent holders, and internationally renowned engineers. •	We care about our employees: we invest in professional development and reward creativity. Starting day one, every employee is bonus eligible and receives 14 days of paid vacation. 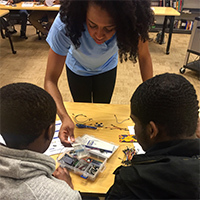 •	We invest in the community: STEMBoard boasts a lively education and outreach program that teaches engineering to the historically underserved.